Nothing makes a woman feel more glamorous than long, lush lashes. Applying false lashes is tedious and time-consuming, and until recently the only other option was a lengthening mascara, that can only do so much. Latisse®, which uses the active ingredient Bimatoprost, is the first and only FDA-approved prescription treatment for inadequate lashes. We have been amazed to find that a product that really works – growing longer, fuller and darker lashes in as little as 21 days. Eyelashes not only protect the eyes, they are also a defining feature of feminine beauty. Long, thick lashes help to give eyes a more open, glamorous look. But as we age our eyelashes start to thin. All our features change over time and as we age we have less eyelashes. Then there are those that may be fair-haired or have less noticeable lashes whatever their age. Now LATISSE® can help give you lashes you’ll love. LATISSE® topical solution is the first scientifically proven treatment that allows you to grow your natural lashes, making them longer, fuller and darker* in just 16 weeks. Unlike other products you may have tried, LATISSE® topical solution is a prescription treatment. It’s scientifically shown to help if your lashes are inadequate. With continuous use the results can be noticeable. 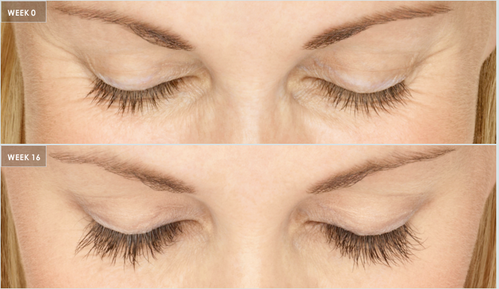 When you start using LATISSE® you may notice a difference in your lashes as early as 4 weeks. But the full effect is seen at 16 weeks. 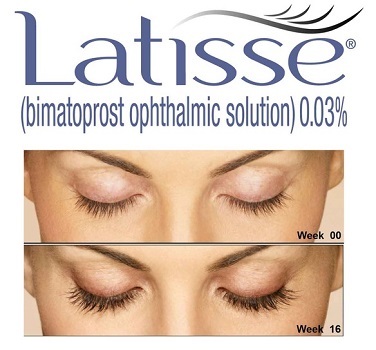 Persistence pays – with a daily application of LATISSE® you will see a noticeable difference. WHAT IS LATISSE® LASH SCIENCE? LATISSE® topical solution is the first scientifically proven treatment that allows you to grow your natural lashes, making them longer, fuller and darker* in just 16 weeks. LATISSE® is believed to stimulate hair growth and dormant hair follicles by increasing the number of lashes in the active growth phase. LATISSE® is also thought to extend the length of this phase. This means that the lashes grow for a longer period and so become longer and thicker. LATISSE® helps you grow your own natural lashes. However, eyelash growth is a gradual process, so while you may notice changes as early as 4 weeks, the full effect takes up to 16 weeks to achieve. So it’s important you continue to use LATISSE® as directed. LATISSE® solution is applied to the upper eyelid, once nightly. Sterile disposable applicators are provided to help you apply LATISSE® correctly. If you would like to know more about LATISSE® speak to one of our cosmetic clinicians at Vital Face & Vein. Call 0800 848258 today for a consultation.